burlington wrote: I don't know where to put this comment -- none of the topics refer to it. I'd like to know where all the amateur photography is. Almost everyone had a camera by 2001; digital point-and-shoots, old film cameras, camera phones, camcorders... There should be literally thousands of REAL videos and photographs of the towers from that day. Not quite correct! Cell phones were slow on the uptake in the USA apparently, pagers were still all the rage in 2001. Nobody had camera phones, they hadn't been invented yet! You have to remember too the topography of New York, a city of canyons! Walk round the block you see nothing except the street you are on! How can you photograph something you can't see! That includes the smokescreen that went up prior to the first demolition charges going off, if indeed they did use demolition charges! i recently saw September Clues on YT, by mere accident, and it rang a long time silenced bell from when i saw the 9/11 events live on tv, back in 2001, in Romania. I', a romanian, now working in constructions in Germany, so please excuse my not so good english. I always beleived the whole thing is veeeeery fishy but i haven't really thought about it much since it happened. But now you created a brand new hobby for me: photo-detective! :-)) So, attashed here is my first try, with a photo i saw here in this thread and wich immediately struck my eyes with its failures :-). For a better view, i think, you have to zoom in into the picture to see what i wrote there. Hm, how do I upload/attach a photo here? i drew/wrote on the photo in Paint so it's not the same anymore as it appears on it's website...please help and sorry again, i don't know this kind of stuff. See the rest of the new video's posted in September 11th 2001 WNYW Dub2 sequence aswell. @ 1:09 when "interview" switches to bald man in blue who says "I saw it all"
Notice behind him there is a fireman standing in the street, and another fireman passing by the stationary fireman and coming towards (and in back of, from camera point of view) the bald man being interviewed. In the next few seconds 4 fireman are seen passing behind the right shoulder of this guy. there are (as usual) pretty weird shadows in it. At 0:37 the shadows of the 2 guys cast in the exact opposite direction. 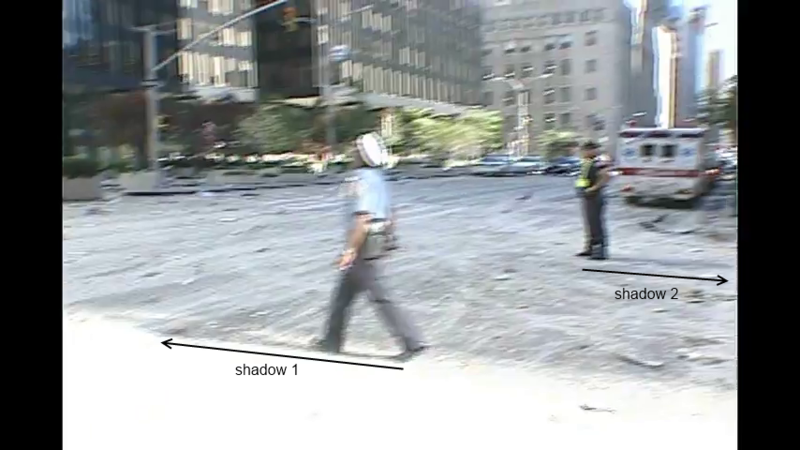 one would assume that shadow 2 could be a reflection shadow, but it oddly is as "thick" as shadow 1. the CGI software possibly didn't differentiate between 'direct' shadows and reflected ones. is another strange creation popping up on Youtube suggesting that fireworks went off up top somewhere (video doesn't pan up) or in the intact wall creating a rain of bright, glittering stuff. I have a feeling this footage is 100% fake and published to confuse people. tak47 wrote: At 0:37 the shadows of the 2 guys cast in the exact opposite direction. one would assume that shadow 2 could be a reflection shadow, but it oddly is as "thick" as shadow 1. the CGI software possibly didn't differentiate between 'direct' shadows and reflected ones. To be sure, I have never observed any such "reflected light" shadows in my entire lifetime. If some Joe would argue that the "SHADOW 2" that you pointed out is due to some sort of "reflected light from buildings across the street", the onus is on this Joe to prove - empirically - that light can bounce from buildings and produce such 'reverse-to sunlight' shadows (as sharp and long as that "SHADOW 2") behind a man standing in a shaded area across the street. How can this fireman have a shadow in a shaded area...unless there were 2 suns shining in New York that day ? At 2:35 the man in the white shirt starts talking to the man in the blue shirt but nothing can be heard. In fact, all of the voices heard in the video seem to be disembodied. Somehow, these voices are heard over the ubiquitous sirens but the man's voice at 2:35 isn't. 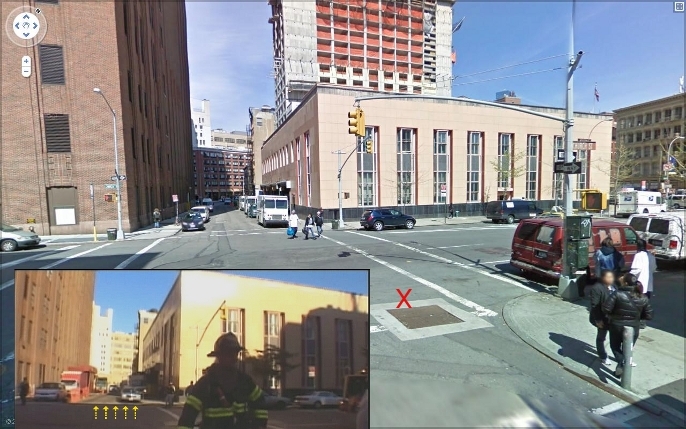 We can see 2 buildings : one white and one red, like a google street view. How can we see all the white building ? Wow, that is a really jerky, weird video. It's hard to say which one is more fake looking, that or the Naudet picture. What do you make of this jerky video, Haze? Could they have built another building there since 2001? The street light in the Naudet video only has 2 lights. 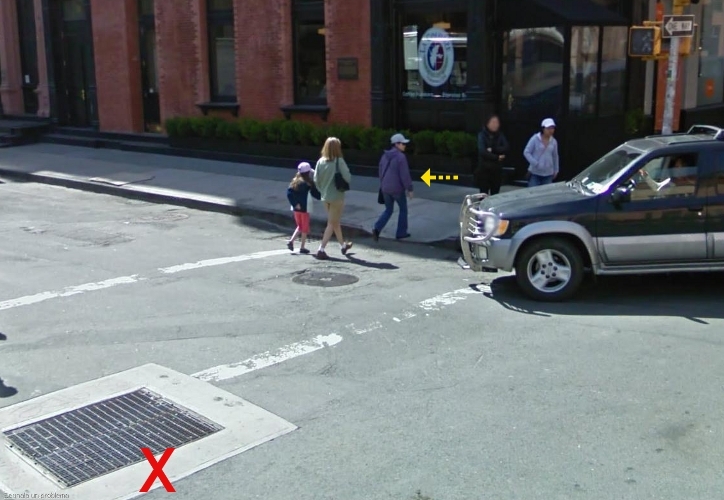 The google street view map clearly displays 3 on the traffic light. I am not saying they didn't change the light after 2001. I am merely noting that they are different. The shadows don't make sense at all...even "preacher man's" shadow - when he's giving his quick interview - the sun is behind him, in the camera view - then when he walks across the street his shadow is towards the direction of the sun. After one year, the counter has increased to 180000.